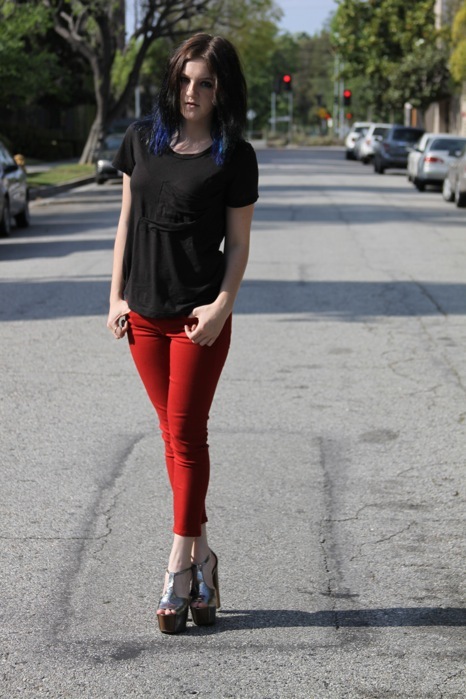 When I was at the Fall 2011 Work Custom Jeans shoot I saw these bright red cropped skinny jeans and died a little inside. I absolutely love them and they couldn’t be more on trend. I love that denim brands are straying away from the typical black skinny jean and going to bight colors and new cuts. I like that the Viper Crop is simple because when a lot of brands notice a trend they tend to over do it, but not Work Custom! The fit in great and they are comfortable beyond belief. Skin tight with enough give for added comfort these are going to be flying off the shelves and I am hoping that the color ranges continue to be a trend in denim. Work Custom Jeans continues to be a favorite brand of mine for its subtle branding (who doesn’t love a simple stitched W on the pocket, great fit and they tend to be the jeans I always wear when I’m dressing up. Work Custom Jeans (IMHO) has done a great job on keeping their collections cohesive and staying true to basic styles that touch a trend without being consumed by it. The WCJ Viper was a favorite and the Viper Cropped is about to become a new favorite. The Work Custom Jeans Viper Crop reviewed here are available online for $170. until today I thought J Brands were the best looking red jeans on the market, but having seen these photos WCJ vipers are my new favourite coloured jeans. I TOTALLY AGREE! These are beautiful and your shoot looks great! I know the second I saw these I had to review them they’ve done a few different styles with this red and it is all killer. Love the jeans, but the shoes are killer. Girl you’ve got skill when I was your age I wouldn’t have walked out in heels like those LOL I was all up into my tennis shoes and sweats. Thanks so much this is one of my favorite reviews and the shoes are Jessica Simpson can you believe it? Love the jeans, but the shoes are killer. Girl you've got skill when I was your age I wouldn't have walked out in heels like those LOL I was all up into my tennis shoes and sweats. I know the second I saw these I had to review them they've done a few different styles with this red and it is all killer.